Video surveillance solution providers have the opportunity to deliver greater value for their customers by capitalizing on the Internet of Things (IoT) and enhanced connectivity. Combining video analytics and big data, real-time response procedures, and emergency response systems are just some examples of how solution capabilities can be enhanced through the IoT. However, it isn’t just about greater value for existing customers; there is also potential for new applications and an expanded base of users. This webinar will explore how customers can go beyond traditional security and safety applications by connecting video surveillance to other systems while also leveraging advanced video analytics. This webcast will provide example use cases as well as guidelines for building surveillance solutions to minimize risks while planning for future growth and new applications deployment. Escape the cycle of complexity. Begin operating with ruthless efficiency. Transforming the data center is a tough challenge, so a successful strategy must include a robust, flexible and scalable storage solution. ScaleIO supports a software centric go to market strategy. ScaleIO is easy to implement, scalable and has a rich API set for ease of use by developers, shortening time to market and product development times. Backed by the Dell EMC brand, ScaleIO is from a proven provider of storage solutions for mission critical applications with full support throughout. With the new generation of Dell EMC Isilon storage, the #1 scale-out NAS platform in the industry, OEM customers will be able to support new, more demanding file applications and workloads; easily keep pace with rapidly growing storage requirements; manage and protect massively large data sets with ease; and gain new levels of efficiency to dramatically cut costs. Digital transformation is driving a need for OEMs to address key concerns — agility, scalability, flexibility, simplicity and automation. 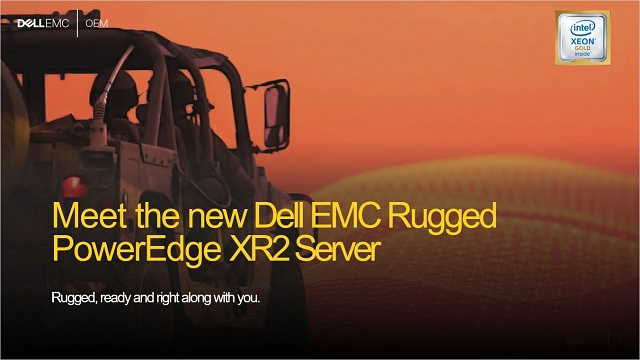 Dell EMC’s next generation of PowerEdge servers meets those concerns head-on with an end-to-end portfolio of scalable, virtualized, software-defined and converged solutions on a common server platform capable of running any application, from traditional to native cloud applications (NCA). With Dell EMC PowerEdge servers, you can build your vision of a digitally transformed infrastructure with secure, worry-free solutions. The video surveillance market continues to see robust growth, with organizations and governments requiring to deter, protect, prosecute and predict with their CCTV systems. Body cameras, as an example are starting to be widely implemented, from places of work with signs ‘it is against the law to insult a staff member’ to police officers roaming the street. Independent studies prove that body worn cameras will reduce complaints, reduce the need for the use of force, and provide incontrovertible evidentiary video - Cameras change behaviour. Pelco & Dell EMCs skill-set and qualifications are helping many customers in the Video Surveillance space, centralize data from hundreds to thousands of cameras, static, body-worn or vehicle mounted. With an estimated global value of $31 billion by 2020, the digital oilfield is the oil & gas industry’s hotbed of innovation. This free webinar will bring you insight from industry leaders Dell and Statoil on how they are driving down costs and increasing production levels by harnessing data driven strategies. While digital transformation has led manufacturers to incorporate sensors and software analytics into their offerings, the same innovation has also brought pressure to offer clients more accommodating appliance deployment options. Case studies and other examples will show how to select the appropriate appliance architecture. During this webinar, Dell EMC executives and SMEs will discuss the issues for telco’s moving to virtualized architectures, the opportunity and the best approach to accomplishing the corporate goals. Although the majority of data for predictive maintenance originates from operations technologies, IT can help with predictive maintenance as well by providing predictive analytics and business data. The discussion will provide you with a solid overview on the current transportation & telematics markets and technology trends, new product offerings and IoT applications that are quickly changing the fragmented and proprietary solutions of the past.